Tha Bòrd na Gàidhlig air sreath de gheallaidhean cudromach fhoillseachadh an-diugh (Diardaoin 9 Lùnastal 2018) bho dhiofar bhuidhnean poblach ann an Alba a bheir taic nach beag do dh’adhartas nas luaithe le leasachadh is cleachdadh na Gàidhlig air feadh na dùthcha. 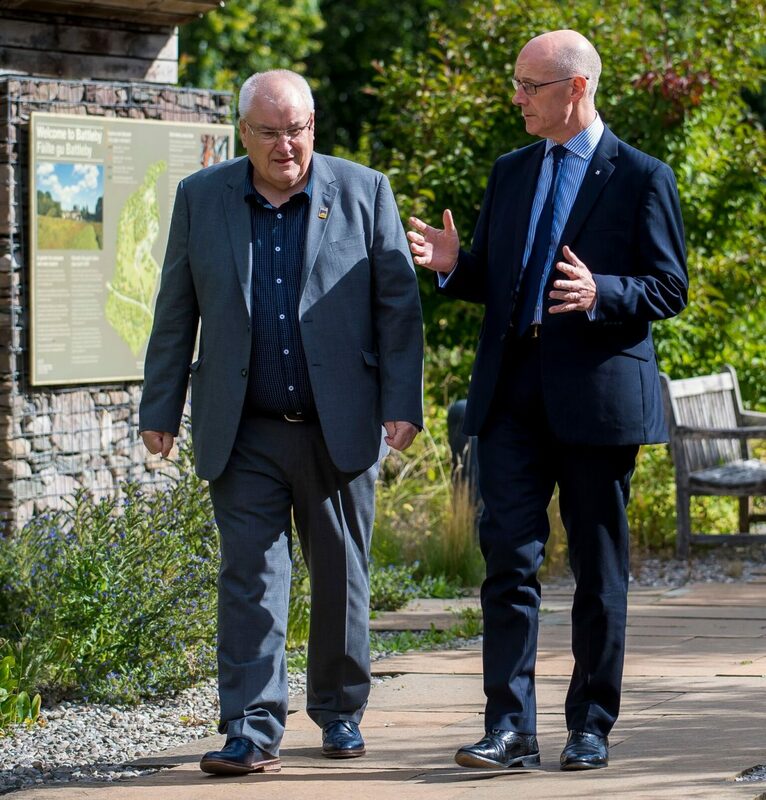 Tha na geallaidhean mar thoradh air coinneamh fhìor chudromach a chaidh a chumail ann am Peairt madainn an-diugh, far an robh an Leas Phrìomh Mhinistear Iain Swinney BPA sa chathair, agus far an robh riochdairean bho ghrunn de phrìomh bhuidhnean poblach na h-Alba an làthair. Le bhith ag aontachadh ris na geallaidhean seo, tha a’ bhuidheann nàiseanta le uallach airson adhartachadh cànan is cultar na Gàidhlig ann an Alba den bheachd gun tèid aca air adhartas nas luaithe a dhèanamh le bhith a’ neartachadh a’ chànain. Bidh gach gealladh a’ toirt taic do chinn-uidhe a’ Phlana Cànain Nàiseanta Ghàidhlig 2018-2023 a chaidh fhoillseachadh sa Ghiblean am-bliadhna. Tha e na amas aig a’ Phlana ùr gun tèid Gàidhlig a chleachdadh nas trice, le barrachd dhaoine agus ann am barrachd shuidheachaidhean. Stèidhichidh Leasachadh Sgilean na h-Alba agus Bòrd na Gàidhlig Buidheann-obrach gus beachdachadh air agus ealla a ghabhail ri molaidhean bhon aithisg, “Margaidh-obrach na Gàidhlig – Am Fiosrachadh Dearbhte”, a chaidh fhoillseachadh san Ògmhios 2018. Obraichidh MG ALBA agus Bòrd na Gàidhlig còmhla air LearnGaelic, an goireas com-pàirteach airson a bhith ag ionnsachadh Gàidhlig – mar phàirt de sin thèid an làrach-lìn ùrachadh, thèid susbaint ùr a chruthachadh, agus bidh taic ùr ann do dh’inbhich a tha ag ionnsachadh na Gàidhlig. Foillsichidh MG ALBA stuthan Gàidhlig air YouTube. Mar phàirt de sin bidh ‘rogha is tagha’ ann, le earrainnean beaga bho phrògraman – ceòl, comadaidh, agus filmichean goirid. Cuideachd, bidh ‘iomairtean com-pàirteachais’ ann a bhios a’ brosnachadh dhaoine gu bhith a’ cruthachadh stuthan Gàidhlig iad fhèin. Nì Iomairt na Gàidhealtachd is nan Eilean rannsachadh ùr air ‘An Àite a th’ aig Cànan is Cultar na Gàidhlig ann an Leasachadh Eaconamach is Coimhearsnachd’, agus cuiridh sin ris an fhianais dhearbhte a th’ ann a chuidicheas le bhith a’ dealbh mhodhan-obrach ùra agus le bhith a’ planadh. Cuideachd, tabhainnidh iad taic do dh’Iomairt na h-Alba le bhith ag ullachadh a’ chiad Phlana Ghàidhlig aca. “Tha Riaghaltas na h-Alba air a chur romhainn mar amas soilleir taic a thoirt don Ghàidhlig. Tha a’ choinneamh an-diugh a’ sealltainn gu bheil diofar sheòrsaichean obrach ga dèanamh is diofar iomairtean gan cur an sàs le taghadh farsaing de bhuidhnean poblach air feadh Alba mar thaic don chànan agus tha e cudromach gun gabh sinn làn-bhrath air an taic sin gus cùisean a thoirt air adhart. “Tha sinn a’ cur fàilte mhòr air na geallaidhean seo. Tha iad mar chomharra air mar a thathar a’ faicinn taghadh farsaing de bhuidhnean poblach a’ toirt barrachd taice do chànan is cultar na Gàidhlig ann an Alba. Chan eil Gàidhlig air an iomall tuilleadh thoradh tha muinntir na dùthcha a’ toirt an aire do na buannachdan cultarach, foghlaim agus eaconamach a thig bhon chànan.